I've now got a lot of concrete/urban bases thanks to Phil's instruction, but what's the best way/colours to make sand look like grass/dirt? I'm painting up 6mm and my grass flock will look ridiculous. Is there a wash, dry brush etc technique that people use? 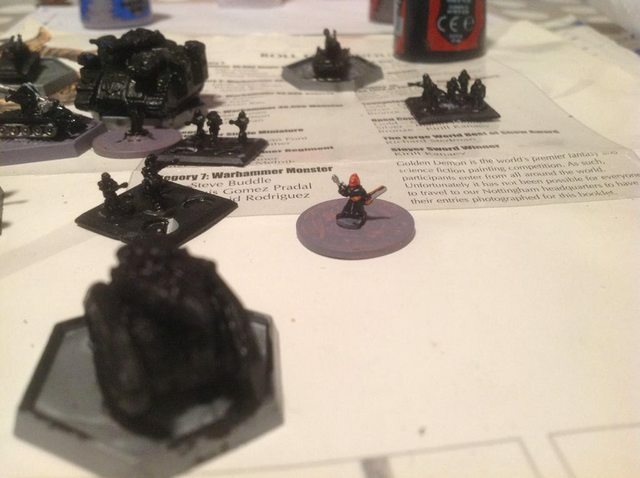 The teeny tiny commissar surveys his growing forces. Wash in sepia ir not required? I used the Baccus basing system on my Romans. They turned out OK.
painting 6mm is way quicker than 28mm but, by gum, it's not as rewarding. Oh well. Epic (or Space Marine as it was when I first came across it) is actually what got me into wargaming in the first place. There's definitely something more strategic and impressive with the way it plays. 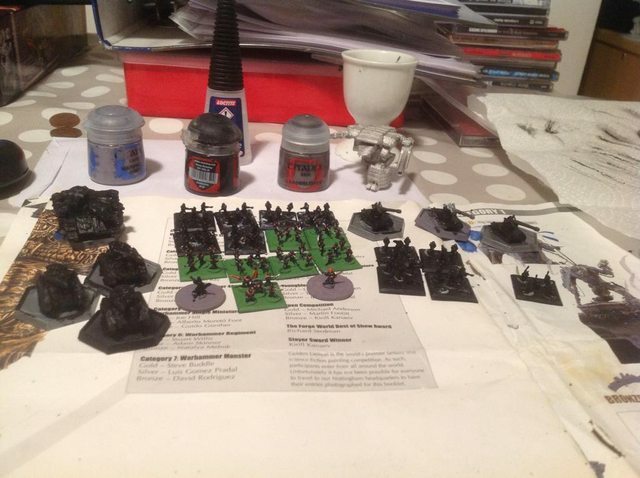 Anyway, here's a 1250pt Imperial Guard army in progress. They'll be lucky to have little pink splodges for faces. What's that? You're all wearing black gas/face masks? Oh, ok then. Not started on 6 MM. yet. I will need to go to specsavers. I've discovered the difference between painting 28mm and 6mm. 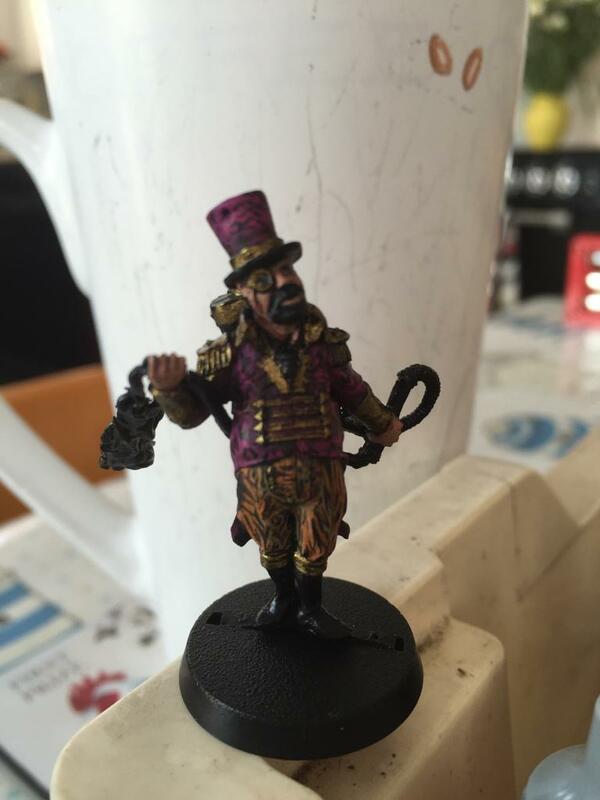 You paint 28mm hoping it will look good. You paint 6mm hoping that it won't look crap. Currently failing on both counts. Is that your favoured colour scheme or are you mocking any Slaaneshi worshipers out there? Oh I don't know. He has a certain rakish air. Done! 1000 points Imperial Guard, no sweat. Unfortunately black doesn't photograph well. Now onto the next 1000, and maybe some titans. They look very good! I wonder what they will look like smashed under heel of my Space Marines? On a separate note, whilst looking for a Death Korpse horse company, I hit on the idea of WWI german cavalry. BAM! Baccus do shed loads of them. Gonna order a bunch to expand my forces. Anyone want in for P&P? Yes, I was looking at Bacchus nepolionic cavalry for my rough riders. I will pick a pack and let you know. Cool. Let me know ASAP. the WWI Germans also have field artillery - something which the Death Korps have. Only problem now is that I'm effectively creating two imperial guard armies, as whilst the gritty mass infantry/siege engines of Krieg look very me, I do like the more flexible Steel Legions with companies of Chimeras and sentinels.